Corrections in digital learning programs Wrong! – Typical feedback? Nobody would consider it acceptable for teachers nowadays to respond to incorrect answers from learners simply by saying “Wrong!” In learning programs, on the other hand, users often have to put up with this kind of feedback. Does this have to be accepted, or are there any alternatives? When learners give wrong or unsuitable answers, teachers try to encourage them to correct them own mistakes by providing hints, asking questions or making non-verbal signs. This ensures that learners have a positive learning experience despite their error. In other words, negative feedback in the classroom is flexible and takes the individual needs of the learners into account. An experienced teacher will correct strong and weak learners differently in an attempt to further incentivize the former and not demotivate the latter. If possible, these same standards should also be applied when correcting mistakes in digital teaching formats, despite technology being unable as yet to achieve the same breadth of possible reactions that a teacher can – or at least not without the technology in question being so advanced as to make it essentially unaffordable. In their essay on “The power of feedback”, Hattie and Timperley make the following observation: “Feedback is one of the most powerful influences on learning and achievement, but this impact can be either positive or negative” (Hattie/Timperley 2007: 81). In other words, one key quality criterion when evaluating learning programs is to assess how the software responds to incorrect written input from learners, as this is an important element when it comes to creating a positive learning experience for users. Back in 2004, Rösler already noted with respect to language teaching that the quality of the feedback relating to learner input is the key quality criterion for learning software and in the long term will determine whether such software is accepted as an integral part of the education system (Rösler 2004: 177). What exactly does quality mean in the context of feedback, however? To answer this question, it is important first to take a closer look at the types of feedback that are available when responding to incorrect input in digital learning environments. Feedback in digital learning environments can be divided (according to Jacobs 2002) into two categories: simple feedback and elaborate feedback. There are three different types of simple feedback that can be easily realized from a programming and conceptual point of view. Consequently, these are the most common forms of feedback in digital learning programs. The feedback type Knowledge of Result (KOR) lets learners know whether their answer is right or wrong. Knowledge of Correct Result (KCR) is a form of feedback that tells learners the correct solution. Often these two types are combined. Answer until Correct (AUC) is a feedback type that allows learners to find the answer for themselves by making repeated entries. This form of simple feedback is suited for example to multiple choice questions with a small number of possible answers because it allows learners to quickly discover the correct answer themselves. Ideally, elaborate feedback (EFB) should be similar to the feedback given by a teacher, skilfully using hints to guide the learner to the correct answer. To achieve this, those creating the exercises must anticipate the errors that the learner might make. After all, the system can only provide feedback relating to those errors that the authors have taken into account when creating the exercise. The more closed the exercise, the easier it will be to anticipate the mistakes. Is elaborate feedback by definition good feedback? It would not be correct to conclude that elaborate feedback is by definition good feedback, however. In learning programs, there is a kind of “dynamism” generated during the exercises: those in which learners only have to use the mouse – like multiple choice questions, matching tasks or drag-and-drop exercises – are known as “quick” exercises. The dynamism of such exercises will be hampered if elaborate feedback is provided in the case of incorrect entries. As can be seen in this short video, learners may well not even read the elaborate feedback. In such cases simple feedback may be more than enough (for a more detailed description, see Bayerlein 2010). “Slow” exercises, by contrast, require learners to enter text. As they use the keyboard to do so, the range of potential errors is broad: learners may make typos, semantic or grammatical mistakes. In such exercises, elaborate feedback should be provided, indicating the type of mistake that has been made and guiding the learner towards the correct answer. Good quality feedback will not disrupt the flow of the exercise here, and will help the learner find the right solution. The more open an exercise is, the more wide-ranging the possible answers will be. What is more, different variants may be correct. This problem can be illustrated by what appears to be a simple exercise requiring the learner to fill in the gap in the following sentence: “Tomorrow … the German class.” Although only four words are actually required to complete the sentence correctly, it is almost impossible for a learning program to assess the learner’s input automatically. Among other things, it would be correct to insert the words “I will go to”, “you will go to” or “he will go to”. It would also be correct to use verbs such as “drive” or “attend”; doubtless there are several more possible answers that would produce a semantically and grammatically correct sentence. All the same, this range of potential answers could in fact be handled by a learning program. But how should a learning program cope with mistakes like “Tomorrow I will goes to the German class” or “Tomorrow you make to the German class”? The former is a question of a grammatical error, whereas the latter may signify that the learner has not understood the sentence as a whole. Treating both these mistakes as equal and responding to them with simple feedback would not constitute a very skilful didactic approach. While a teacher could quickly analyse the mistake and give corrective feedback that reflects the cause of the error, this is largely beyond a learning program’s capabilities. One possible way of dealing with the open nature of learner input is to guide learners to the correct answer by correcting their answers one letter at a time. This is the approach used in the learning programs of the Goethe-Institut and Cornelsen-Verlag. Appropriate corrections in open exercises | Photo: © Cornelsen Verlag In the illustrated example, the program is also unable to determine whether the mistake in question is a grammatical or semantic error, or merely a typo. The trick, in other words, is for authors to design learning programs that contain exercises that appear to learners to be as open as possible. In actual fact, however, they should be closed enough by the context to enable meaningful feedback to be provided. Digital learning programs with appropriate feedback can create an intensive learning experience that learners can access anywhere and at any time and in which their mistakes are corrected immediately. Nonetheless, such programs make no claim to be able to replace but merely to complement classroom teaching. When choosing digital learning programs, teachers should check how the program handles incorrect learner input. The best way to do this is to intentionally enter various types of mistakes in order to see what feedback the program gives. If the feedback helps the learner find the correct answer, one key quality criterion has been met. Bayerlein, Oliver (2010): Lernerbeobachtungen zur Nutzung von Feedback bei einem videogestützten Online-Sprachkurs für Deutsch als Fremdsprache. In: Info DaF, Volume 37, Issue 6, p. 570–576. Hattie, John/Timperley, Helen (2007): The power of feedback. In: Review of Educational Research, Volume 77, Issue 1, p. 81–112. Jacobs, Bernhard (2002): Aufgaben stellen und Feedback geben. 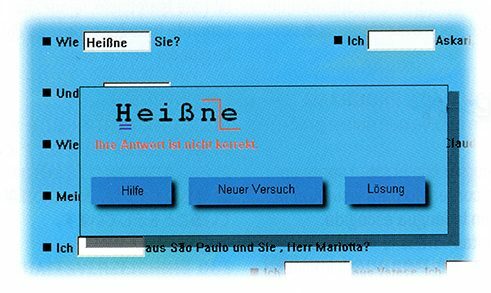 Rösler, Dietmar (2008): E-Learning Fremdsprachen – eine kritische Einführung. Tübingen: Stauffenburg. Dr Oliver Bayerlein is a professor of linguistics and German as a foreign language at Nanzan University in Nagoya in Japan. He is the author of learning programs and textbooks.